Gravity: Similar to earth. 45 kilograms (100 pounds) on Earth is 49 kilograms (107 pounds) on Saturn. Saturn is the most recognizable of all the planets because of its rings. Saturn spins so fast that it actually has a distorted shape. Instead of being truly spherical, it bulges around the middle. Saturn weighs very little for its size. If there were a lake big enough, Saturn would float! As with other books in the “Super Explorer” series, there is a lot of information in this small book. Each page has great photographs of planets, moons and space equipment as well as digital images of superheroes who are the guides through the book. Each planet has at least a double- page spread. Other topics covered are: “What is a planet?”, “What is a moon?”, “How do planets form?”, “An overview of the solar system”, “Moon exploration”, “Planetary rings”, “Asteroids”, “Dwarf Planets”, “Exoplanets”, and “Is there life beyond Earth?”. As this book has a more systematic feel to it (it goes through the planets from closest to farthest), I believe a table of contents and index would help youngsters quickly find specific information rather than having to flip through the book. 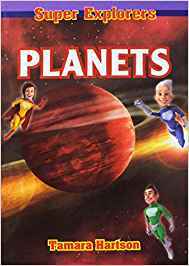 Planets is a great book that targets younger readers. The publisher suggests the age range of 6-9, but the book would be of interest for those a little older as well. The facts present modern information that would satisfy most curious readers and lead them to ask further questions about planetary bodies. The superhero images add an engaging element to the book where other books have chosen to use specific labeling patterns (e.g., “When you see this yellow question mark, it indicates something to think about!”). John Dryden is a teacher-librarian in the Cowichan Valley, British Columbia.